Found 3 file extension associations related to Microsoft Reader and 3 file formats developed specifically for use with Microsoft Reader. 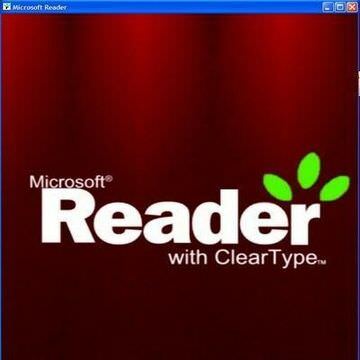 Microsoft Reader is utility used to read e-books on a computer. Microsoft Reader uses own eBook file format. Remarkable content support: Enjoy thousands of Owner Exclusive eBooks on any Microsoft Reader 2.0 or higher enabled device. Great on-screen readability: ClearType display technology that makes text on screen crisper and easier to read than ever before. Dynamic reading features: Enhance your texts with highlighting, bookmarks, notes, and drawings. Plus, you can view your annotations and rename or erase any of them at any time. Great portability: Activate Microsoft Reader on your desktop and mobile devices and take your eReading library wherever you go. And because they require less space than the same titles in other formats, you can carry more Microsoft Reader eBooks! One-click eBook creation. Create your own eBooks from Microsoft Word documents using the Read in Microsoft Reader add-in for Microsoft Word 2000 and higher. If you need more information please contact the developers of Microsoft Reader (Microsoft Corporation), or check out their product website.